The Boulder City Council met recently to explore the possible purchase of a conservation easement on the Long’s Gardens site at 3240 Broadway, Boulder. The site consists of 25.1 acres which is zoned agricultural. This timing is critical in that the Long family members are willing to negotiate a conservation easement and the preservation of the site at this time. With involved family members of an elderly age and out of town, the timing of this negotiation becomes critical. Whereas the price may seem high ($4.7 M in its entirety), the cost of foregoing this opportunity in terms of conservation, preservation and sustainability is higher. The Long family has a history and a vision of working with the city to preserve this 100 year old farm. This is our opportunity, at a critical moment, to join together and let our voices and shared vision be known. City Council needs to hear from the community as to their support of this endeavor. As the Blue Line defined Boulder years ago, the Long’s Gardens site and Growing Gardens will define Boulder’s future for generations to come. 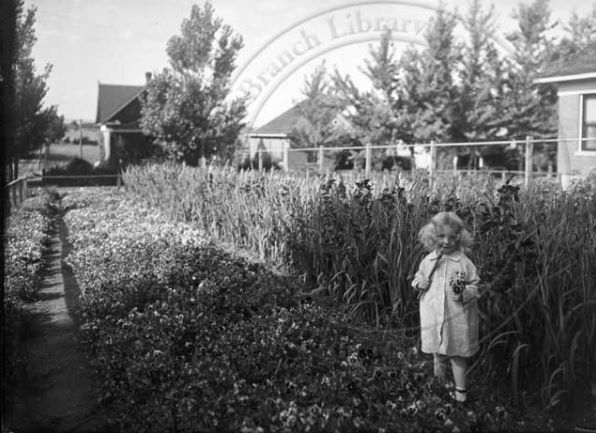 The long term vision includes a conservation easement put in place between the city and Long’s Garden family members as a means of preserving the 25 acre site, the historic structures which have supported the 100 year old farm, and the value in terms of an urban farm within the center of the Boulder community. Suitable soils and water necessary for food crops, with an intact water delivery system, are an irreplaceable resource in the center of our community. Protecting these resources in the heart of urban Boulder is one of the most forward-thinking investments the city can make. This investment appears consistent with recent Comprehensive Plan revisions acknowledging the city’s desire to remain on the leading edge of promoting a sustainable local food economy. The Long’s Gardens property is the foundation of Growing Gardens’ urban farming operation. The site currently houses the Growing Gardens not-for-profit organization and has for the past 11 years. Growing Gardens is not just a “community garden” organization, but has an extensive outreach program. Over 10,166 individuals participated in Growing Gardens programs in 2010. Of these, 4,415 were low-income, 270 were youth, 140 were people with disabilities, over 1,422 were gardeners, 53 were seniors and 3,700 children. Growing Gardens worked with a total of over 100 schools, community groups, agencies and corporations. They donated 8,000 pounds of produce in partnership with the Boulder County Farmers Market and through their own Market Garden, to those in need. There were 554 individuals volunteering 3,872 hours of their time to benefit our programming. City Council acknowledged that the preservation of this site would give Growing Gardens the greatest opportunity for success and could well be, and should be, a world class success, furthering Boulder’s core values of sustainability. Council acknowledged that there exists an unparalleled opportunity to preserve this urban farm, to allow for expansion of the Growing Gardens facilities at the Long’s Gardens site, and has empowered city staff to move forward with obtaining an appraisal of the property. All City Council members acknowledged the value of the property and the desire to preserve the historic structures and urban farm operation. Many expressed concern over the purchase price and the ability for the city to consider this purchase at this time with energy issues in the forefront. There was discussion as to funding options, the ability to acquire agricultural grants, foundation support, partnerships, etc. There was discussion of the increased densification of central Boulder and the value of this urban farm within that context. There was strong support for sustainable, publicly available agriculture, with acknowledgment that this is a unique property and opportunity. Council directed staff to move forward with a current appraisal of the property and further consideration of options for preserving this legacy. Read the draft version of the conservation easement. Growing Gardens is currently looking for sponsors for our Harvest Dinner scheduled at the Longs Gardens, Hawthorne Garden site on August 6, 2011. Corporate sponsors are an important part of this celebration and support is vital to making this program possible. All community members are invited to attend the Harvest Dinner and tickets may be purchased at growinggardens.org. For those unable to attend, silent auction items are welcomed. Previous Topic: Fasten Your Seatbelts — the Campaign Has Begun!